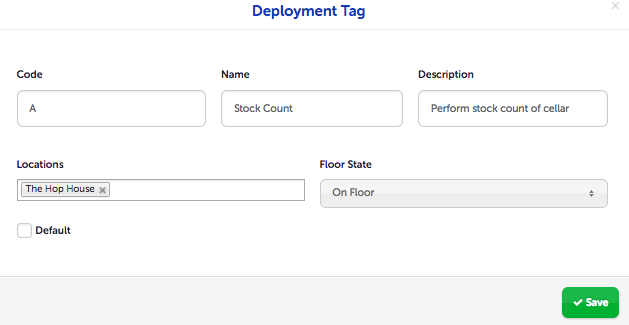 Deployment Plan is a daily task allocation tool which enables you to assign specific tasks to your employees during their shifts. To create a new task, first navigate to Deployment Plan - Tags on the left hand menu bar. Click the green Add button in the top right corner which launches a dialogue box where you can enter the task information. Each task is 'tagged' to a unique 1 letter identifying code which you assign. Give the task a name and enter a description. Then assign the task to the location(s) that it is relevant to. The Floor State field is optional. Here you can enter where the task is to be carried out on your premises if required. There is also a check box called Default which you can tick or leave blank depending on how you want to allocate your tasks. 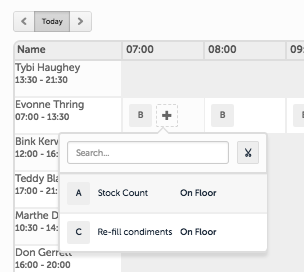 Ticking Default means that when you build your task rota, the task is automatically allocated to all employees when they are on shift. From here, you can remove the task from the employees you don't want to carry it out. If you do not tick Default, then no employee will be automatically assigned the task. When you set up the task rota, you will be able to assign the task to the relevant team member(s). Selecting Default is best suited to common or frequent tasks that most employees will carry out each shift. For less frequent tasks we recommend not using Default. Once you're done, click Save to create your new task. Task B, 'Re-stock Bar' has been set up as a Default task. This is because re-stocking the bar is an ongoing task to be carried out periodically throughout the day by multiple employees as items are sold. The other tasks are less frequent and should be carried out at specific times as defined by the manager, so have not been set up as Default. To edit your Deployment Plan, now navigate to Deployment Plan - Today. Unlike The Scheduler, Deployment Plan is set up on a day by day view. The Default task, Task B, has been applied to each employee throughout their shifts. You may decide that you don't want your managers carrying out Task B. You can remove Default Tasks from employees by hovering your cursor over the box where the task appears. To remove the task, click the cross that appears. 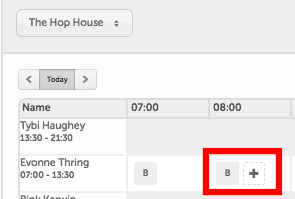 To add tasks that are not set as Default, hover your cursor where you want to add them and click on the plus sign that appears. Select which task(s) to include. Once you've built your Deployment Plan, click Save. You can print it for display on premise by hitting the Print button. If you make changes to your Schedule after you've finalised your Deployment Plan, you can refresh it by clicking the Regenerate button.